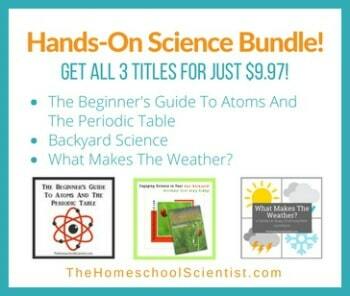 Welcome to Day 5 of the Summer Science Series at The Homeschool Scientist. It’s all part of the iHomeschool Network Hopscotch blog hop. Join in the fun! For centuries, people have been using clouds to predict the weather. For instance, high wispy cirrus clouds, sometimes called mares’ tails, meant that within 24 hours the weather was going to change. This summer, teach your kids how to be weather forecasters. Teach them about the various types of clouds and what they tell us about the weather. Like I mentioned before, cirrus clouds are those high wispy clouds. Seeing a few in the sky mean that fair weather is on the way. If the cirrus clouds are growing in number and almost cover the sky, look for rain within 24 hours. Altocumulus clouds are mid-level clouds that look like a layer of white and gray puffy cotton across the sky. The presence of these clouds on warm, humid mornings may mean afternoon rain is on its way. 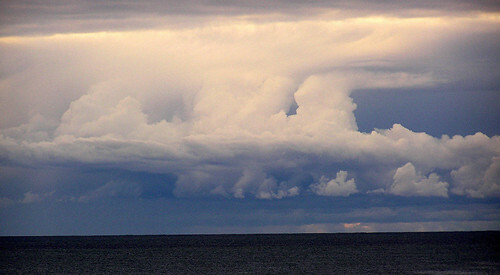 Sometimes, cumulus clouds can build vertically into what is called cumulus congestus. These clouds resemble a head of cauliflower in shape. They are still considered fair weather clouds, but are capable of causing a short rain shower. Cumulonimbus clouds are sometimes called “thunder heads”. They are huge towering clouds with dark bottoms capable of producing wind, rain, lightening, hail and tornadoes. These are the most dangerous of the clouds. Stratus clouds are low, gray clouds that mean cold, misty rain or snow. Sometimes these clouds reach the ground and form fog. Get more cloud and weather information and links from the Studying The Weather post from last summer or from The Homeschool Scientist’s Weather Science Pinterest board. Now comes the fun part. With your children’s new found cloud knowledge, head outside. Determine what type of clouds they are. Take pictures or make drawings of the sky. What do those clouds tell us about the weather? Have each child make a weather prediction. Go back later to see if the predictions were correct. This would be a fun project to do throughout the summer with your family. Keep a weather notebook and record the cloud types and predictions. Make a note about other weather factors like temperature, humidity and precipitation. Don’t miss the rest of the Summer Science series….. I still remember the cloud study I did in 5th grade. I need to formalize some of what I’ve taught the kids about clouds, it’s mainly been as we’ve been driving or observing things…..